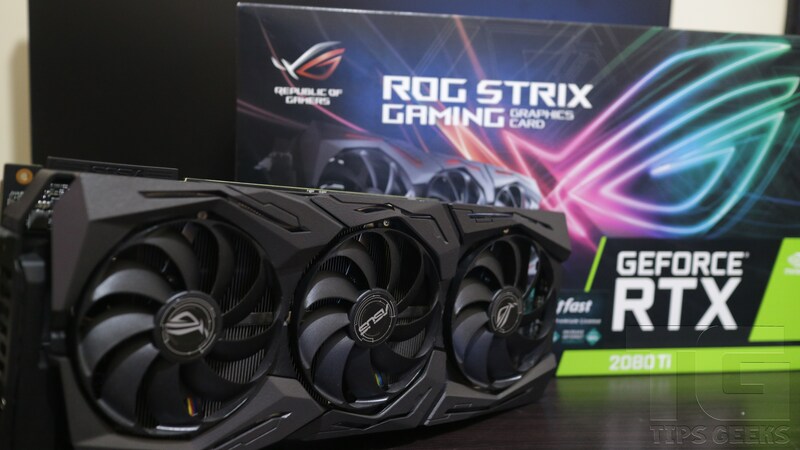 With the recent release of the RTX series by Nvidia, all we hear are the performance levels of one of the top brands, the ASUS Republic of Gamers, so we had to get a chance at their top RTX model – ROG Strix RTX 2080ti 11GB OC Edition. In terms of popularity, only a few can match up to the ASUS Republic of Gamers. So, let’s put their latest product to the test. This utilizes the new 12nm FinFET manufacturing process with the addition of the GDDR6-VRAM to try and make a significant improvement in terms of speed when compared to the 10-series. With the inclusion of the Ray-Tracing Technology unlocking incredibly realistic lighting and shadow effects. The Strix 2080Ti keeps the triple-fan design of former Strix designs with some updated fans. The ASUS ROG RTX 2080ti adopt a 2.7-slot footprint to be able to input a bigger heatsink. 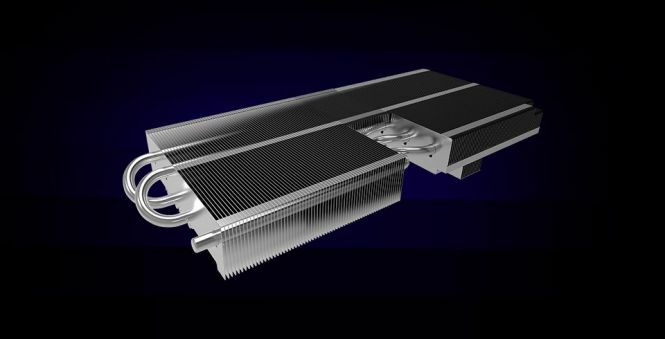 They’ve increased the overall surface area of the cooling array by over 20% compared to the 10-series. Now, maximizing the ROG Strix GeForce® RTX 2080Ti’s performance gives a lot more thermal headroom for overclocking. There is no denying that the Strix cards are beefy offerings. It sports the ASUS DirectCU cooler, has Gaming and OC modes to help push your clock speeds even higher, and provide AURA lighting. 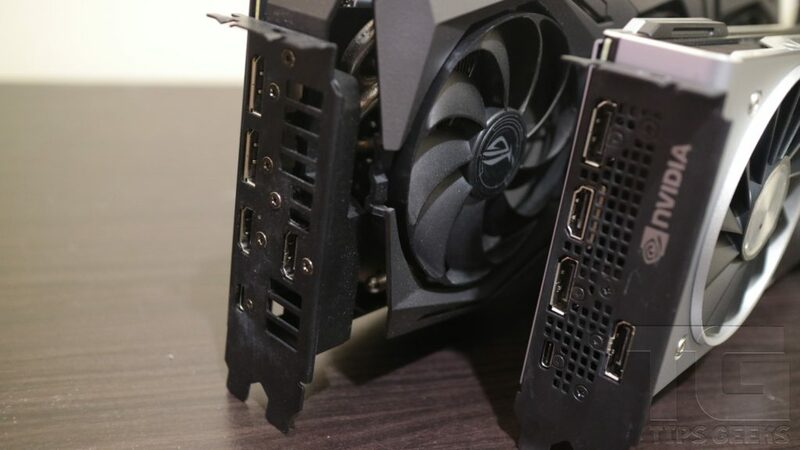 Coming from the vanilla cards of Nvidia, the DisplayPort number dropped from three to two, while the Strix has an addition of an HDMI 2.0b port. Still no DVI-D here though, which would mean that if you have one of the older monitors, it is time to get something with one of these two inputs. 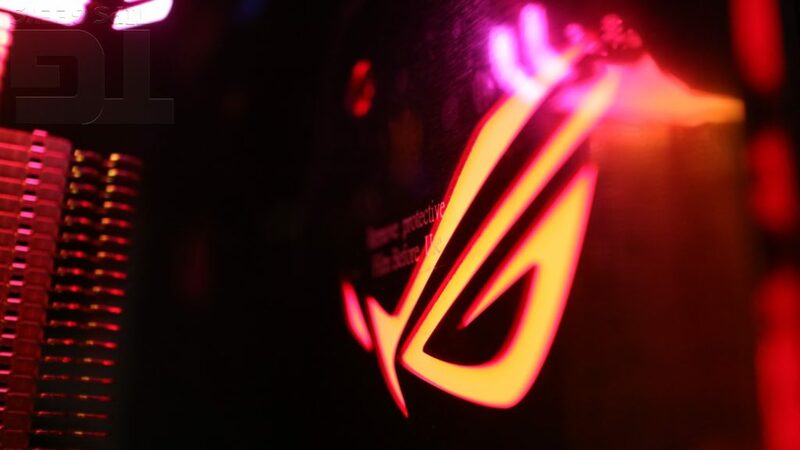 The ROG logo also has RGB Aura Sync support, so that is definitely an addition to any aesthetic conscious folks. Both the RTX 2080 and RTX 2080Ti of ASUS ROG has an 8+9 PCIe power input setup that provides more than enough to power your cards. All testing was performed at stock settings. Looking at the performance level per card, we see that they don’t really differ depending on the brand. More or less 1000 points difference. To those that might ask why we added the RX Vega 64, it is for reference that the RX Vega 64 performs in between 1070ti and 1080 GTX cards. We have yet to see if the upcoming AMD Radeon Instinct will perform alongside the RTX series but then again, we still lack DLSS games and all we are able to show are synthetic benchmarks with little to no difference from the 10-series aside from the extra lighting and shadowing in rendering. Nothing new here. Like all our previous game benchmarks, we set the settings to Ultra and despite the difference in 4K and 1080p resolution, the ROG Nvidia RTX 2080Ti Strix OC was able to handle it pretty easily. We experienced minimal drops in FPS with the Nvidia RTX 2080Ti FE. For those wondering why we put the AMD Radeon RX Vega 64, this is to give way to the AMD card that we had. Of course, this performs between 1070ti and 1080 and we expect better performance with the Radeon Instinct that has been announced just recently. Only at the very top, and in 4K, does the Strix manage to eke a tiny margin, then again given its pricing we’d hope it could find some performance. The more we put the Ray Tracing graphic cards to the test, the more we are impressed at the consistency of performance it gives. Nvidia definitely has been upgrading their GPUs to deliver massive performance upgrades. Despite the lack of RTX and DLSS games, consistency has been a way that Nvidia has been winning with their cards. Performance across both the ASUS ROG Nvidia RTX 2080Ti Strix OC and Nvidia RTX 2080Ti FE is exemplary. 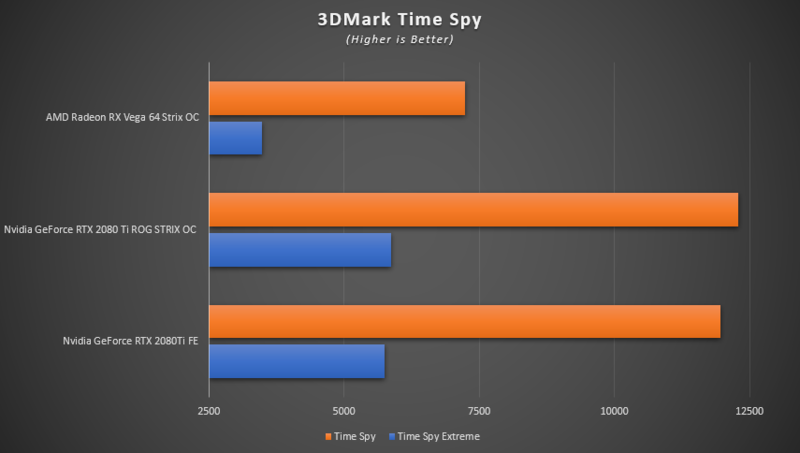 The stock tests we ran with the regular BIOS rather than the OC mode showed how providing fast boost clocks with the Nvidia GPU Boost 4.0 is more than enough. In terms of build quality, we believe that it will always be just an extra bling to any rig but then again, it is the additionally RGB lighting and ROG logo on the backplate is a particular highlight, especially as it’s in the place that is easiest to show off. 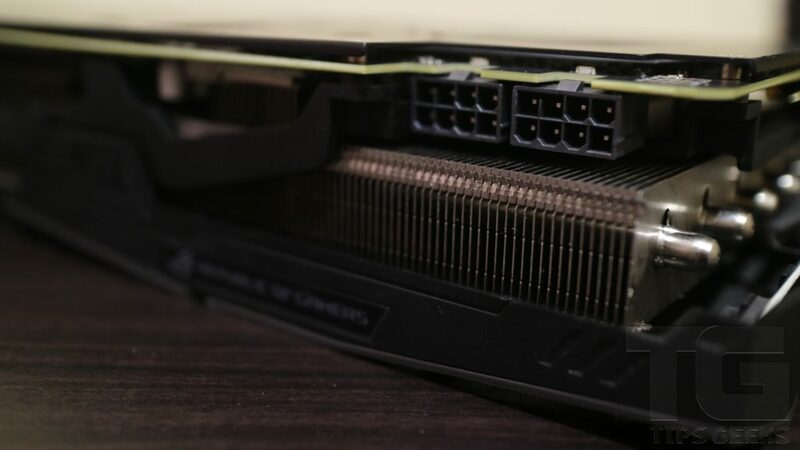 Previously the nVidia reference cards were good examples of the breed that found popular homes with people who would strip off the fairly poor air cooler and put on a water block or an AIO solution. With the pricing being so competitive any minor performance deficits could be overlooked. This also meant that the main brands could apply their custom cooling and bells and whistles secure in the knowledge that the consumer would pay a bit more for the simplicity of an air cooled card which had more performance than the reference model and allowed them to demonstrate their brand loyalty. The only downside to the ASUS ROG Strix RTX 2080TI is the whopping price of PHP 91,1140. It is a premium brand with a premium product and ASUS believes that. Of course, the Aura Sync is one of the best options in terms of having a whole brand ecosystem in your home. So, we believe that this is priced pretty steeply but deserves the price it was given.